We also agree that Enhancement may have survivability problems and understand that players don’t necessarily feel they can afford the bonus Stamina from the Toughness talent, at least in PvE. We don’t have an immediate change to deploy here, but it’s something we’d like to fix and a candidate for future patches. With an extremely high uptime on flurry, fellow enhancers can look forward to an increase in not only Auto Attack dps, but also Maelstrom Weapon procs, Static Shock procs, Flametongue procs, trinket procs, and weapon procs. The increase in Maelstrom Weapon procs should also lead to a higher uptime on the 4-piece tier 10 set bonus. This seemingly small tweak will actually increase enhancement DPS by quite a bit. At least, that’s the theory. The second part of GC’s post addresses a long standing issue that Enhancement Shamans have had. Being a melee spec that shares gear with a ranged class leads to enhancement being one of the squishiest classes. 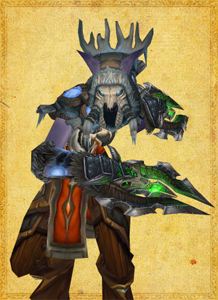 Couple that with a lack of defensive cooldowns (the 2-piece tier 10 set bonus makes Shamanistic Rage a DPS cooldown), and you have the makings for many dead dual-wielders. Hopefully the devs can figure out a way to not only make my DPS higher but also make me invincible in the process. Then, and only then, will I be completely satisfied. Here’s to hoping that makes it into the big class changes announcement tomorrow. Rogues *are* pretty squishy. Arguably the most squishy. We’re the only class wearing leather that is locked into a purely melee role. Of course, that was more of an issue when pulling aggro mattered on most fights. Still, these days, a mob turns on you and that’s it. Hope they have a slow swing speed and you can get your Vanish off in time!